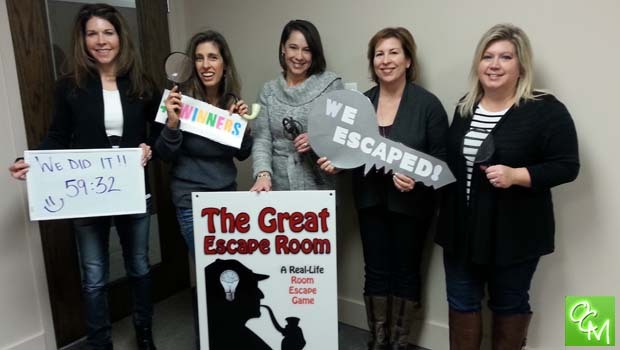 The Great Escape Room Royal Oak review, pics, video, and info. The Great Escape Room is located at 301 W. Fourth Street. The concept of The Great Escape Room is to solve puzzles in order to “escape” a locked room within 60 minutes. The Great Escape Room is set up as part scavenger hunt and part puzzle. Groups of up to 12 people are literally locked in the room and have to put their heads together to find clues and solve logic puzzles that will lead to their escape before the 60 minutes are up. The puzzles at The Great Escape Room are a real-life experience based on the genre of computer and mobile phone escape games. The Great Escape Room is a family owned business with locations in Orlando, Miami, and Royal Oak. More locations are coming soon. The puzzles at each location are the same and change out after months of bookings so people can come back to have a new experience. The Royal Oak location is even planning a completely different second room to open in February. And eventually, they will open a third room that is identical to the first room so two groups can go head to head and compete on their escape times. The Great Escape Room is great for adults, as well as kids ages 12 and up. They also have a party room so you can hold birthday parties there for anyone 12+. The Great Escape Room Royal Oak MI invited me to come out and try it out for myself with some friends. This was truly an experience of teamwork at its best. We worked well together to escape the room with only 28 seconds to spare! Only 20% of the people who enter the room actually escape within the 60 minutes. We were pretty impressed that we completed it, and had a lot of fun doing it. This proved to be a great option for a girls day out of fun. There are discounts available for parties of 10 or more and on weekdays. Additionally, The Great Escape Room hosts a Puzzle of the Week contest where people can submit answers for a chance to win free tickets. The puzzles are posted on their website.